It's My Darlin' Featured On NYMag! Readers! Very exciting news on the It's My Darlin' homefront. The fashion editor of New York Magazine's website recently contacted me to ask permission to use my photos in a new street style fashion feature that they will be doing every week called Street Comber. 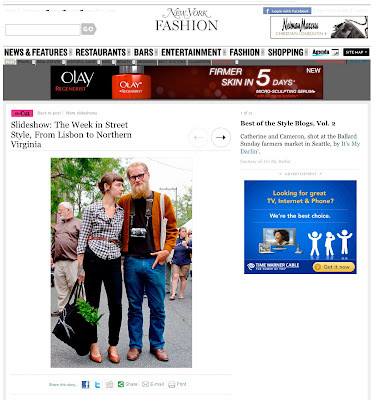 It will be an ongoing feature in The Cut (NYMag's fashion section). Each Friday Street Comber will feature a slideshow of choice street style photographs taken from around the world. I was so excited and honored to be contacted but honestly didn't think anything would come of it. I also didn't want to say anything in fear that it would jinx me. Well, despite my lack of positive thinking, I am thrilled to tell you that the first week after being asked I checked yesterday's Street Comber slide show and the first picture in it was one of my shots! Remember this lovely couple at the Ballard Market that I posted last week?